Embossed Slot ceramic ball: 1)patented product, 2)ISO9001:2000, 3)40 years' production experience, 4)high efficiency in towers. 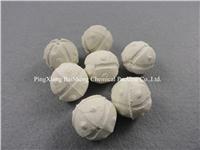 Embossed Slot Pe rforated Efficient Ceramic Ball（Patent No. :ZL2005201337860）is developed on the basic of KK perforated ceramic ball by slotting on the sphere, and by forming lot of knobs uniformly on the sphere of the ball. It can increase the surface area and free volume, and decrease the bulk density, It can increase flux of the fluids and decrease the resistance of the system. 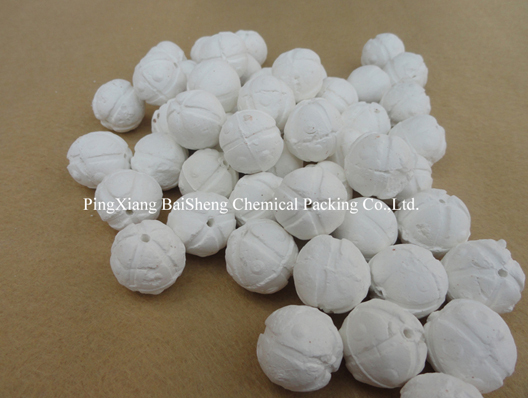 As a new efficient support and covering material of catalyst. It can be widely used in oil refinery,chemical,fertilizer,natural gas and environmental protection industries. 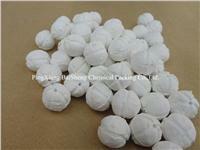 Chemical Industry Standard HG/T 3683.3 - 2000 Industrial Ceramics Ball – Inert Ceramics ball.